So what are the Socialists saying about David Miliband as the head of US refugee contractor? That would be the International Rescue Committee (one of the top nine federal contractors ) which, with much fanfare, hired the former British Foreign Secretary and pal of Tony Blair, David Miliband, to head one of the largest resettlement contractors bringing refugee “workers” to your towns and cities. We reported the news here on March 27th. 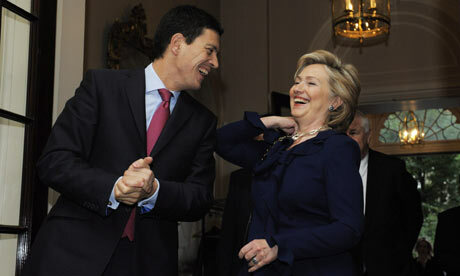 Miliband yukking it up with Hillary! Pay attention Leftwingers! If you think the “humanitarian” refugee program is all about good works—helping the poor and the downtrodden and all that—think again! This story is nearly a month old, but since I’m not in the habit of reading the World Socialist Web Site, it only just now arrived in my inbox thanks to reader Jim who spotted it. Socialists say the IRC is a front for imperialists! No kidding! David Miliband, older brother of Labour Party leader Ed Miliband and former foreign secretary, is stepping down as the MP for South Shields and taking over the job as head of the International Rescue Committee (IRC) in New York. In his new job, Miliband will be playing a “role in the political intrigues of British and US imperialism” says WSWS. The IRC covers many of the geographical areas Miliband became involved with while at the Foreign Office in the UK—South Sudan, Afghanistan, Iraq, the Palestinian Authority, Sierra Leone and Sri Lanka—where both the US and Britain have extensive business and geo-strategic interests. The majority of the IRCs funding comes from government sources (that would be you!). Miliband will make a larger salary than the President of the United States. At the Foreign Office, Miliband oversaw an organisation employing 14,000 staff across 270 diplomatic offices. The IRC may be smaller, but its international reach is greater. It operates in more than 40 countries and within the US itself, with offices in 22 American cities. The IRC has an operating revenue of around $390 million. A look at where the majority of its funding comes from gives an indication of whose interests it serves. According to a report on the IRC from Root Cause, a non-profit research and consulting firm, published in the Independent, only 14 percent of its funding came from private sources. Government grants and contracts, in contrast, accounted for 44 percent, foreign government grants and contracts 27 percent and 11 percent from UN agency grants and contracts. As its president, Miliband will receive £263,000 a year (US$400,000) plus £30,000 (US$52,000) from related groups—five times the salary he received as an MP. By the way, the refugee resettlement industry in the US is a billion dollar a year industry—a billion that we know of! IRC: Independent? Or, hidden political agenda? There has been criticism over the appointment by those who believe it will risk the IRC being exposed as an instrument of Anglo-American foreign policy. The Observer reports Michiel Hofman of Médecins Sans Frontières saying it could make dealing with groups such as the Taliban more difficult. “Assertions by humanitarian organisations that they are fully independent, there are no hidden political agenda, slowly wither away,” he said. When interviewed, he appears as a petulant schoolboy waiting for something bigger and better to come along. In the meantime, he has turned his hand to making considerable amounts of money. He has reportedly amassed almost £1 million through public speaking engagements such as the recent lecture he gave in Abu Dhabi, for which he received £25,000. He set up a company, The Office of David Miliband Limited, which right-wing commentator Toby Young has attacked as a tax-avoidance scheme through which his non-parliamentary earnings are channelled. You know what scares me about the article (read it all! )—I find myself agreeing with much in this report at the World Socialist Web Site! Ahhhhhhhh! Next ›Best day ever at RRW yesterday! Reblogged this on JESUSCHRIST / YESHUA THE MESSIAH IS COMING SOON ! / JESUCRISTO EL MESIAS VIENE PRONTO ! / JOHN 3:16 / JUAN 3:16.